Scholarship applications for most future and current undergraduate & postgraduate coursework students are online via this website (scholarships.unsw.edu.au). Some external or other scholarship programs may require a different application process, so please check the information listed. The indicative value of scholarships can be found in the relevant advertising and is confirmed in the Offer Letter that is sent to successful applicants. UNSW reserves the right to change the value of scholarships based on availability of funding. Applicants should not make decisions about undertaking study based on the availability of scholarship funding. Scholarships are limited in number and do not cover the full cost of tuition fees and living expenses you will incur as a full-time student. 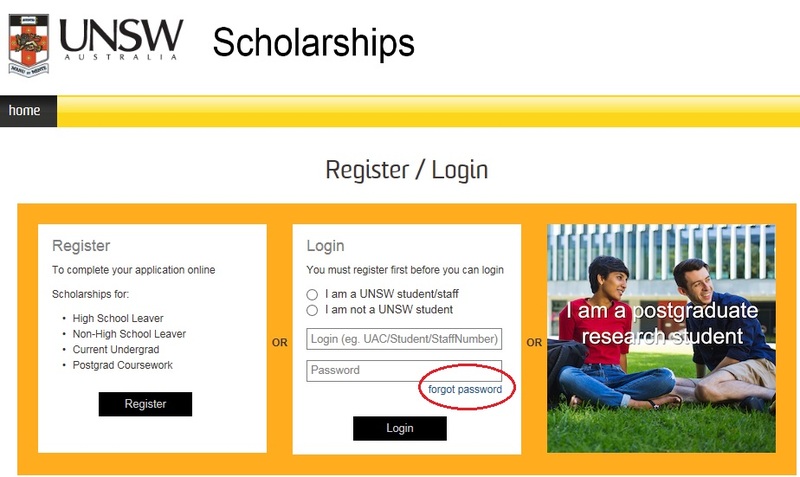 To begin using the UNSW Scholarships online application system you first need to register. *A local applicant for scholarship purposes means an Australian Citizen, Australian Permanent Resident, Australian Permanent Resident (Humanitarian Visa Holders) or New Zealand Citizen. New Zealand Residents are not considered local applicants for scholarship purposes. ** If you do not yet have a UAC Number, please use your Board of Studies number with a leading "1" e.g. "112345678". You MUST ensure you update to/provide a valid UAC Number prior to final submission of any scholarship applications. I don’t have an UAC number how do I register? If you are a domestic student, the registration login requires a 9 digit number. Please temporarily use a 9 digit number - ie the Board of Studies number with a leading "1" (e.g. "112345678") or create a 9 digit user name that you can remember. However you MUST ensure you update this to a valid UAC Number as soon as you receive it. How many scholarships can I apply for? UNSW Scholarships encourages you to apply for multiple scholarships, provided you meet the Scholarship(s) eligibility criteria. Where can I check the progress of my application? Your submitted application(s) and progress of application(s) will only appear in the 'Submitted applications summary" section. You will automatically receive an email reminder to login once the result of your Submitted Application(s) is available. If the status of your scholarship application is showing as 'being assessed' it means that applications are being reviewed. Once results are released, the status of your application will be updated. Can I hold multiple scholarships? Our general advice is that you may apply for, be offered and accept multiple scholarships, however the Manager of UNSW Scholarships will make a determination on which scholarships may be held concurrently based on the terms and conditions of the various scholarships. Can I change my application after submitting it? You are able to un-submit your application before the closing date, which means you can edit your application up to this time, even if you have already submitted. You need to click on 'Complete your draft applications and submit' on the left hand menu and find the little red 'undo' arrow next to the scholarship you wish to un-submit. Once you have completed your application, you are able to submit again. We cannot accept late applications. Please check the scholarship deadlines carefully and ensure you submit your application and supporting documentation by the dates listed. Most scholarships cannot be deferred. If you are choosing to defer your program (e.g. to take a gap year) and you have received an offer of a UNSW Scholarship you will need to contact UNSW Scholarships to check if your scholarship can be deferred or not. I am not a current UNSW student. Do I need to apply separately for admission to UNSW? Yes. Submitting an application for a scholarship does not constitute an application for entry or guarantee entry to programs at UNSW - applicants who are not current UNSW students must apply for admission to UNSW separately. Click here for information on how to apply to UNSW. Should you be offered a program or faculty specific scholarship, it is your responsibility to ensure that you enrol in/are enrolled in the correct program. 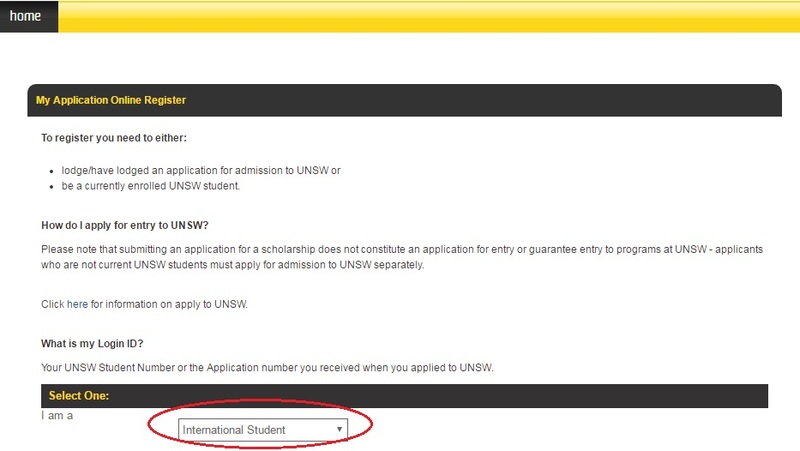 For those currently seeking entry to UNSW, it is your responsibility to ensure that your UAC preferences are such that you gain entry to the program required by the scholarship. What are Equity Scholarships (ES)? Equity scholarships assist students who may experience financial or other educational disadvantage with the costs of tertiary study and help them reach their academic potential. If you believe you experience any of the types of disadvantage listed below, you may be eligible for Equity Scholarships. Applicants wanting to be considered for a UNSW Equity Scholarship must submit a UAC Equity Scholarship (ES) application. How do I know if I can apply for a Rural Scholarship? UNSW Scholarships considers anyone who is not classed as living in a "Major city of Australia" a rural student, however some scholarships list specific requirements and you should always check individual scholarship criteria. In most instances rural areas will be considered according to the Australian Standard Geographical Classification - Remoteness Areas. You can check your status by using the link below. If you are currently living interstate you should only use the link below as a guide. If applying from a capital city in any state other than NSW you will be classed as living in a "Major city of Australia". It is important to check the details of each scholarship for any other documentation that might be required. Please note also that supporting documents need to be uploaded as one PDF file. Are New Zealand citizens eligible to apply for scholarships? New Zealand (NZ) citizens are generally eligible to apply for scholarships that are open to domestic students (Australian citizens and Permanent Residents). Please check the specific scholarship eligibility criteria however as some programs may not be open to New Zealand citizens. Please also refer to this link for the latest advice on a range of Australian Government reforms that may affect NZ students studying in Australia: http://studyassist.gov.au/sites/studyassist/helpfulresources/pages/faqs-nz. The following websites provide more information to international students interested in studying at UNSW: Future Students and UNSW International. Students looking to undertake Postgraduate Research Programs (Master by Research or PhD) should visit the Graduate Research School web site. UNSW Scholarships manages all undergraduate and postgraduate coursework scholarships. Scholarships usually require a separate application process to applying for admission. Scholarships are highly competitive and there are fewer scholarships than applicants. We also have very limited scholarship programs for international students. International Students should not rely only on scholarship support in order to study at UNSW, as there are no programs that will cover the full costs of studying and living in Australia. The best way to search for UNSW scholarships is to visit our website: scholarships.unsw.edu.au. There are many different scholarships with different eligibility criteria and closing dates. Please select International in the Residency field to be directed to scholarships relevant to International Students. To narrow your search down, you’re able to select criteria relevant to you; this is helpful if you want to find scholarships specific to a certain Faculty, degree program etc. ALL scholarships available through our office are listed on this site and any new scholarships will be listed as they become available. Once you click Search, a list of scholarships will generate based on what you entered in your search. By clicking on the title, you will be taken to a page containing the detailed information of the scholarship. Make sure you read through this information carefully - it lists important information such as eligibility and selection criteria, which will help you determine whether or not you are eligible to apply. I don’t want to apply for the scholarship I selected anymore, can I delete my application? You can only delete a draft application after the closing date for that scholarship. Due to the large volume of scholarship applications, we cannot provide individual feedback to applicants regarding their application or why they were unsuccessful. If you attended an interview however, you may be able to request feedback from the interview panel. For privacy reasons UNSW Scholarships does not usually announce the successful recipients of scholarships. Can I reapply or apply for other scholarships if I don't receive one in first year? Yes! Scholarships are also available at UNSW in second and later years of many programs, so when you enrol at UNSW continue to visit www.scholarships.unsw.edu.au. You may also be eligible to apply for an Honours Year and Travel Scholarships which could provide you with a wide range of enriching experiences. Can I still apply if I decide to take a gap year? Yes. If you take a gap year you can still apply for a Scholarship when applications open again the year after you complete your HSC if you didn't undertake any university study towards a degree during your gap year. Why haven't I received my scholarship payment? Scholarship payments are processed each term, subject to UNSW Scholarships confirming you met the Scholarship ongoing eligiblity requirements. You have completed the Scholarship Acceptance Form and have provided your bank details. Your bank account details are correct. You are admitted and enrolled in a UNSW program. You meet the ongoing eligiblity requirements of your scholarship (i.e. Enrolment, Program/Plan, Academic Progress). However, if you have not received your scholarship payment or believe you have been paid the wrong amount, please contact UNSW Scholarships. What are the Terms & Conditions associated with holding a UNSW scholarship? Conditions of scholarships vary; however they will be clearly outlined in the offer letter sent to successful applicants. You will need to ensure that you understand the conditions for your scholarship as part of the acceptance process. What is the Enrolment Requirement of my scholarship? Each Term UNSW Scholarships reviews the enrolment of recipients to confirm their eligibility to receive their scholarship(s). The Enrolment requirements relating to your scholarship is outlined in your offer letter(s). You must inform UNSW Scholarships of any variations you make to your enrolment so that accurate and timely scholarship payments are maintained. Leave of absence, degree program transfers and withdrawal from courses can affect your scholarship payments. What is the Academic Progress Requirement of my scholarship? Each Term, UNSW Scholarships reviews the academic progress of recipients to confirm their eligibility to receive their scholarship(s). Academic progression requirements relating to your scholarship is outlined in your offer letter(s). If you change your enrolment or do not make satisfactory academic progress, you must contact UNSW Scholarships. Your scholarship will be reviewed and may be suspended or terminated. If your scholarship is to be suspended we will send a notification email to your student email account. If you do not meet the academic requirement of your scholarship we may also notify your Faculty and they may request that you attend an interview with an Academic Advisor to discuss your progress. How will my scholarship be paid? Tuition Fee Scholarships: The scholarship/award is paid directly to your tuition fees each term, prior to the term census date. Stipend Scholarships: The scholarship/award is paid via Electronic Funds Transfer (EFT) into your nominated Australian bank account. Residential Scholarships: The Scholarship is paid directly to your College in the form of credit notes. Please refer to your UNSW Scholarship Offer letter for information on how your Scholarship is paid. If you wish to change your bank account details before receiving your first payment you should contact UNSW Scholarships. If you wish to change your bank account details after receiving your first payment, please log onto myUNSW and update your bank account details. If you have any questions about scholarship payments please contact UNSW Scholarships. Can my scholarships be paid in advance? No, Scholarship payment dates are stipulated in the offer letter. If you are experiencing temporary financial difficulties, click here for information about student loans. If you choose to apply for a student loan, you must indicate that you are receiving a scholarship. Are scholarship payments regarded as income for Centrelink? Generally, scholarships that provide remission or exemption from fees and/or HECS are not regarded as income for Centrelink purposes. However, an allowance of any kind paid directly to a student may affect your Centrelink benefit. Please keep a copy of your scholarship offer letter to give to Centrelink, if required. Information about how Centrelink treats scholarships is available from Centrelink's Youth, Student and Austudy Hotline on 132 490 or from: www.centrelink.gov.au/internet/internet.nsf/individuals/exempt_equity.htm. UNSW does not withhold PAYG tax from scholarship or award payments. For this reason it is the responsibility of scholarship and award recipients to check with the Australian Taxation Office (ATO) and/or an independent tax adviser to ascertain if the payments they are receiving are classified as taxable income. Scholarships or awards held by students who are enrolled full-time are generally tax exempt. Scholarships which include a work experience component are generally tax exempt provided the work experience is not compulsory (i.e. the offer letter states 'you may be invited to undertake work experience with (company name) over the summer vacation period'. Scholarships held by students who are enrolled part-time are generally not tax exempt and may need to be declared as taxable income. For more information on whether or not your non-government scholarship is taxable please go to the Scholarship page on the ATO website. I’ve received a payslip for my scholarship payment, does UNSW Sydney view me as an employee? No. UNSW makes scholarship payments through the payroll system but scholarship recipients are full-time students (not employees). Some students may also be enrolled part-time and be in receipt of scholarship payments, however that scholarship income may need to be declared to the ATO - refer to the ATO for further advice. Do I need to provide a donor report? All scholars are invited to submit a donor report or thank you letter. A reminder to complete this will normally be sent in October. Will my scholarship/award details appear on my Transcript when I graduate? Can I contact the donor(s) of my scholarship? Scholars should not attempt to directly contact donors/companies that may be contributing to their scholarship program. You will be given an opportunity to write a scholar report and thank you note which will be passed on to the donors. Please contact UNSW Scholarships office should you wish to discuss your scholarship. All coursework scholarships are managed by UNSW Scholarships and any and all correspondence regarding your scholarship should be with this office. What is an Annual Scholar Report? Some scholarships will require an annual scholar report to be submitted to the donors of your scholarship. If this is a requirement of your scholarship as detailed in the offer letter, we will send you a notification in October with instructions on how to submit this. How can I establish a Scholarship? If your Faculty, School or Unit would like to set up a coursework scholarship program, please contact UNSW Scholarships to discuss the process and obtain the correct Protocol documentation. I am trying to login into my account but I forgot my password? I am trying to apply for a scholarship but it says that I am not in the correct stage? How can I fix this? UNSW Scholarships are provided to specific stages in your Academic studies. If the error message appears that you are not in the correct stage you may need to update your profile in order to be eligible as you may be a 2nd year but the Scholarship is only available to 3rd year student or High School leaver. I clicked on forgot password but I have not received a new password? Please check your inbox and junk mail. If an email has not reached you please check you are using the correct Login ID when entering your details into the system. I don’t have an UAC number, how do I register? If you are a domestic student, the registration login requires a 9 digit number. Please temporarily use a 9 digit number - ie the Board of Studies number with a leading "1" (e.g. "112345678") or create a 9 digit user name that you can remember. However you MUST ensure you update this to a valid UAC Number as soon as you receive it. I have multiple supporting documents, how can I upload all the documents? 1. You scan your documentation to your computer then "print/convert" them to PDF (if you have Adobe Acrobat Professional or a third party tool that enables you to create PDF documents). 2. If you have access to a PDF Photocopier/Scanner (available at many work places or perhaps your school) you can create a PDF copy of your documentation that way. Please make sure that you have included all documentation as specified in the Scholarship advertising. Please make sure you submit your application and upload your Supplementary Material prior to the closing date of the scholarship. Late applications will not be accepted. What supporting documents should I provide? I am receiving an ‘invalid session’ notification. If you are receiving the "invalid session" notification, you are likely trying to log in using your Z number. You probably have an existing account already. If you have forgotten your password, you can re-set it and the link will be sent to the email address you used when you initially registered. What does the ‘grade’ mean in General Questions? The grade field in the General Question session refers to the year you attained the achievement you are selecting. I have my Z number but I am not a current student, how do I register? Postgraduate students or International students who have begun their application process and received their z number but have not yet been admitted to UNSW will need to choose the “other future UNSW student“ option. Please have a look at the screen shot below. What does "Other Application" mean? Why can't I apply for the individual scholarship I am interested in? When viewing the advertisement for an individual scholarship through your ‘my application’ that is part of a Common Group Scholarship Application, it will have under ‘Application Process’ a blue hyperlink that re-directs to the Common Group advertisement on the main website. To avoid going in a loop and to apply for the Common Group Scholarship Application you will need to type in the scholarship code for the common group in the search bar in ‘search and apply for scholarships’ through your ‘my application’ section on your personal profile. The scholarship will then appear in the search results and you will be able to click on ‘Apply Now’ to begin your application. I have received a Scholarship offer but it says I require a UNSW Student ID. I do not have a UNSW student ID, what can I do? As outlined in the Scholarship Acceptance form, "If you do not have a UNSW Student ID (zID) you will need to update it once you have received an Offer of Admission [to UNSW]." The status of your Scholarship Offer will be updated to "Accepted - Details required". Once you have received an offer of admission, you will need to update your login details and provide UNSW Scholarships with your bank account details. I have received multiple Scholarship Offers, can I accept them all? If you have received multiple Scholarship Offers, please contact UNSW Scholarships for advice. I received an email advising me I have received a Scholarship Offer. How can I view and accept the offer? Details of the Scholarship Offer is available online your scholarship account. Click on ‘Register / Login’. Select ‘I am a Other Future Student’. Enter your UAC Undergraduate Admission application number or your UAC Equity Scholarship application number (if applicable). You will then receive an email advising you of your temporary scholarship password. Log into your Scholarship account using the login details provided in the email. Click submit applications and view the offer letter. If you have any questions about the offer or have any issues logging in, please contact UNSW Scholarships. I received a UAC notification regarding my Equity offer. How do I accept? UAC sends an initial notification to Equity Scholarship applicants who have been made a scholarship offer. UNSW Scholarships will send a formal offer letter within 24 hours with further details including the name of the scholarship, value and duration, and how to accept.